SD Pharmaceuticals CREATINE HCL is an ultra-concentrated form of creatine hydrochloride and has greater solubility, uptake and effectiveness than all other forms of creatine! CREATINE HCL does NOT cause any bloating or water retention and there's no loading phase or cycling off required. Nearly 50% GREATER Absorption than Buffered Creatine! The major advantage Creatine HCL offers over all other forms of creatine is greater solubility. Research conducted in a university lab showed that Creatine HCL provides significant improvements in aqueous solubility over other forms of creatine, such as creatine monohydrate and buffered creatine. Better solubility means better absorption, and the research showed that Creatine HCL has nearly 50% greater oral absorption compared to creatine monohydrate and buffered creatine. Why is SD Pharmaceuticals Creatine HCL better than all other forms of Creatine? Creatine HCL is more water soluble than all other forms of creatine. As a result, the dosage required to deliver maximum benefits is much smaller than all other forms of creatine. 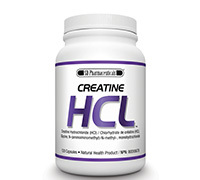 Since Creatine HCL has greater solubility, only a very small amount of fluid is required for absorption to take place. Other forms of creatine, including monohydrate and buffered creatine, require much more fluid for absorption to occur. Since Creatine HCL requires minimal amounts of fluid for absorption, it does NOT cause any gastrointestinal (GI) distress, water retention or bloating! Essentially, Creatine HCL provides the absolute most efficient method possible for enhancing creatine levels in the body! How does SD Pharmaceuticals Creatine HCL enhance muscle growth, performance and recovery? Enhances ATP energy metabolism and results in greater strength, performance, and recovery during high-intensity exercise! Increases muscle cell volume and protein synthesis, which results in BIGGER and FULLER muscles! Increases satellite cell activity, which stimulates NEW muscle fiber growth! Recommended Dose (Adults): Take 2 Capsules twice daily. Take separately from products containing caffeine.